Why should Catholics care about Trump’s tariff war? American farmers. In the past week, the Chinese government has announced the possible implementation of new tariffs countering those recently levied on foreign goods by our own government. Among these are new duties on pork from the United States and the threat of similar tariffs on U.S. soy and grain. For the American grower, this is no mere bluster between aggressive heads of state; China is a chief consumer of U.S. produce, and farmers rely heavily on that business to make ends meet. The potential trade war will exacerbate an already difficult situation, and while the powers-that-be puff out their chests, those who provide our daily bread will be left in the lurch. All those who eat are called to care about the plight of those whose work produced the eating. If, as the farmer and writer Wendell Berry has said, “eating is an agricultural act,” then each of us is implicated in these moral concerns. These are matters that should tug especially at the Catholic conscience. Adherents to a faith that professes God himself to have been a worker and to have described himself as a “vinedresser” and “shepherd” should always be attentive to the concerns of those laborers who, unseen to most of us, provide our most basic necessities. The last several popes have articulated a vision of “integral ecology” that has become a part of Catholic social teaching and that compels the faithful to work toward integrating care for the land, for workers and for the poor. Today, the suicide rate for agricultural workers (a category that also includes fishing and forestry workers) is higher than for any other profession—five times higher than the general population and more than double that of military veterans. This statistic is only one indicator of the larger reality that farmers face: an agricultural economy that forces producers to work long hours for uncertain and minimal compensation. Even as the farmer is compelled to work harder than ever, the social networks that once supported rural life have been undercut, and the demands of the current food production system have forced farmers to overwork the land with methods that damage the long-term health of the countryside they care for. The life of the farmer has always been difficult and uncertain. But there have been elements of rural life that softened its rigors, as Pope John Paul II pointed out in his homily to Iowa’s farmers. The special gifts of the farmer's life, he said, were gratitude, care for the land and tight-knit community. Indeed, it is this closeness to nature and the solidarity among those who work the land that has given farming its savor to so many. More and more, these supports have been knocked out from under the farming family. The hollowing out of rural communities, the endless pressure for higher yields from a small number of cash crops and the methods by which farmers are often required to meet those demands have diminished what were once the personal satisfactions that compensated farmers for their toil. This has often left farmers struggling under debt, worn out and not knowing how they will make it to next year. It is difficult for those of us who benefit from the farmers’ labor to imagine the weight on their shoulders or to really feel the herculean task that faces them at the start of each season. The response to this hidden crisis for a Catholic must be at once spiritual and corporeal. "It is the dignity of those who work on the land and of all those engaged in different levels of research and action in the field of agricultural development which must be unceasingly proclaimed and promoted," Pope Paul VI said in an address to the World Food Conference in 1974. The first task is to show a solidarity and fraternal concern for farmers and to promote the work of the rural church in providing that solace the faith affords to those in tough times. But it is not enough to stop here, for Christ not only called his followers to pray and preach, but to feed, clothe, comfort and bring justice. The issues of today’s agricultural economy are complex and admit no easy solutions, but all those who eat are called to care about the plight of those whose work produced the eating. In another address to farmers, John Paul II recalled that God gave the Earth to humankind “to till and to keep it.” This divine charge, he said, requires that we seek out social and organizational measures that promise fair remuneration for the farmer’s labor and that support the healthy balance between productivity, care for the land and family life. This would include, for starters, halting these tariffs that threaten to deal a serious blow to the already suffering sector, but beyond this, it may require an effort at a more serious reworking of the agricultural status quo. I would not pretend to know the answers, but these are questions to which we must apply ourselves with seriousness and urgency. In so doing, we will begin to participate in the good work and gratitude that comes from farming and eating done well. This is not, at this time, in the realm of Catholic commentary. WE do care about farmers, but steel workers too. Let's see what the President and Congress settle on before we pass judgement, besides this is so far just positioning. As long as they can bash Trump. .
A few facts are in order. We export about 1 billion dollars of pork to China. Not trivial but not such that it is a make or break part of the US hog industry. Most farmers are large conglomerates owning 10's of thousands of hogs/pigs. Ever wonder what the difference between a hog and a pig was. A hog is a big pig. The classification is done by weight. China is by far the largest consumer of pork products in the world and US imports are a drop in the bucket to them but are considered much better than home grown pork because of how they are raised and fed. China purposely picked pork, a minor product because they knew it might affect Trump politically. This paean to the USA farmer would carry more weight, in my mind, if it didn’t erroneously idealize the group. I have noted elsewhere that, in the current political context, a majority of these very same people voted for the president who now gives them the potential of disaster from a trade war that he promised during his campaign. Like many other USA citizens, farmers didn’t think it meant them! In addition, many USA farmers exploit foreign workers – documented and undocumented – with low pay and worse living conditions. These are no paragons of virtues. Yet they voted for a man who proposes to deport undocumented foreigners all because they are rapists and criminals. I don’t read many stories in the newspaper or on the net about such cases happening among farm workers! Oops, I forgot, the president fabricates such stories all the time. Nor do I hear or read many reports of USA farmers as an industry advocating for maintaining strict regulations on environmental issues as the current administration rips them apart. Will our food be grown in tainted soils with tainted water? Do they care? Agriculture is a tough business. USA farmers struggle to succeed. They are not the paragons of virtues that this article would have them be. They are like the rest of the Trump majority…. eager to get rich quick at the expense of others. Having expressed my chagrin with the group, I do not disagree with the idealism of the article. Except who is going to persuade them of such. As I write frequently, you don’t hear about these things from pulpits in Catholic churches, or do you? Am I only one who hears pious pap on Sunday mornings that avoids discussing current issues of moral impact? Trump is at odds with most of the Catholic agenda but many Catholics agree with him. Lots of conversion needs to be done. They are like the rest of the Trump majority…. eager to get rich quick at the expense of others. Seems that describes the Democratic Party, the party of the rich. Most rich people vote for Democrats. It is the common person that has been voting for Trump, tired of seeing the system rigged by the Democrats against them. Can we quit demonizing people who vote differently than you? I agree that the original comment was wrong. If you are a family farmer there is no "get rich quick". More educated individuals vote for Democrats. The upper 1%, such as the Koch's? Support the Republican party. Iowa’s congressional delegation, five republicans and one democrat, sent a letter of caution to Trump on tariffs. 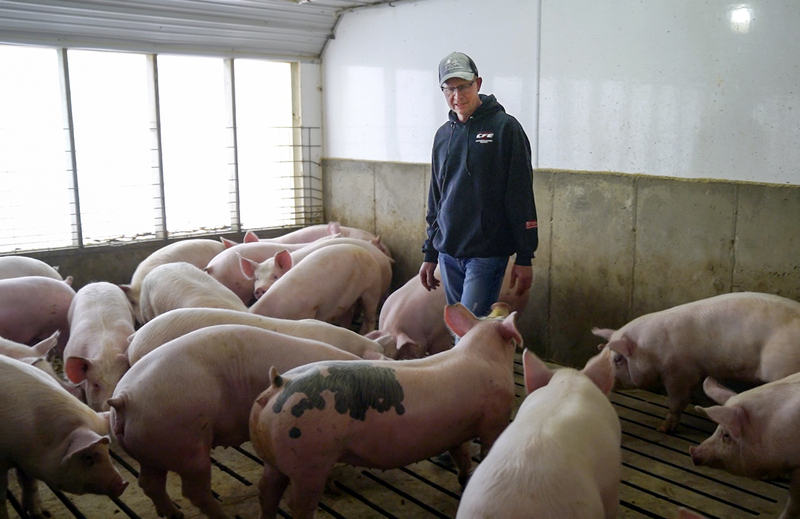 Iowa raises nearly a third of the nation’s hogs. Iowa hog production consumes one quarter of Iowa’s corn and soybean crop. One third of Iowa’s soybeans go to China. U.S. soybean crop acreage, if located in the east, would cover the states of New York, Pennsylvania, Maryland, Massachusetts, New Jersey and Connecticut. A 30% steel tariff would end any new construction of steel intensive buildings for hogs, farm equipment and grain silos if any farm construction budgets survived the loss of export sales to China. Agricultural exports overall support more than 1 million jobs nationwide. I know Mr. Beacom is writing from Iowa, but I challenge his opinion that farmers over-work the soil. This may have been the case in the years leading to "the Dust Bowl" but most farmers work closely with the ag-extensions, seed and herbicide companies, farm equipment manufacturers to optimize output with minimal damage to soils. Trump should be given credit for the effort he and Trade Representative Lighthizer are making to curb theft of intellectual property by the Chinese. Oh, and by the way -- Cargill employs as many people as Boeing. Catholics have had ample opportunity to consider the effects of voting for a serial liar and ignorant, corrupt candidate. We now have an occupant of the White House who is an ignorant, corrupt president who lies all the time. He harms multiple groups of people - farmers are just the most recent group. This looks to me like the wages of sin - it must have been a sin to vote for Trump. I am surprised that the bishops couldn't recognize sin when it was staring them in the face. Nathan Beacom writes from Des Moines, Iowa. His writing has previously appeared in The Public Discourse and The Des Moines Register.